The MEPcontent product library has put out a new Revit plugin: the Raccorderie Metalliche Product Line Placer. As its name suggests, the plugin helps users design with Raccorderie Metalliche metal projects more seamlessly inside of Revit. MEPcontent is an app and plugin library for engineers in the mechanical, electrical and plumbing fields, which calls itself "the largest BIM library for MEP engineers." Essentially, it works with part-manufacturing companies like plumbing manufacturer Raccorderie Metalliche to make manufacturer-specific content. It was acquired by Trimble last year as part of their acquisition of MEP content provider Stabiplan B.V. But, as this release shows, the acquisition hasn't stopped it from creating useful content outside of Trimble. 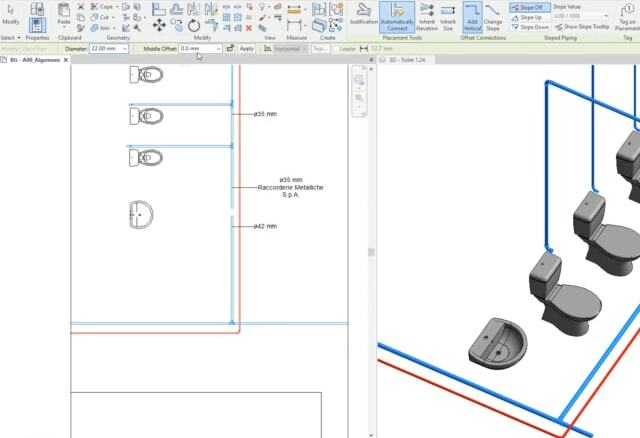 The Product Line Placer works directly on top of Revit. Users working with this plugin don't need to manually select the appropriate pipe fittings for the job; all they need to do is click and draw, and the correct fittings are added automatically. They can also now draw flexible pipe systems with special bends that let them draw in every direction, or easily switch to making advanced connections with real-world fittings rather than Revit custom fittings. Finally, users can work with in-app predefined schedules and order necessary items directly from inbuilt material lists, making the design-to-fabrication process easier. While the plugin has localized content for Italy, France, Belgium, Germany, the Netherlands, and the United Kingdom, it can also be used outside of these locations. And, while its main selling point is pipe design, it can also be used for ball valves, draw-off valves, bends, compensators, reducers, and flanges. "Customer satisfaction is and always has been the main objective of every action and every activity within Raccorderie Metalliche," says Guido Ceccardi, CEO of Raccorderie Metalliche. "This is why we chose a global partner as MEPcontent [sic]. Thanks to their experience, MEPcontent enables us to offer practical, flexible and continuously innovating solutions to MEP engineers."